Processed foods brought us convenience, and the space program brought us freeze-dried technology and Tang. Wax-lined milk cartons and homogenized milk came into common use in the 1930s and 1940s. Milk that isn't homogenized contains globules of butterfat that rise to the surface as cream. The homogenization process forces milk through tiny openings, which breaks up the globules to keep them suspended in the liquid. This results in milk that is creamier, whiter and more appetizing. By the 1950s, most dairies were selling homogenized milk. Even though cartons were becoming more common, many dairies continued to use glass bottles well into the 1950s. When the pull-open spout and plastic laminated lining were invented in the 1950s, the carton became the preferred method of milk packaging. The switch to cartons was completed in the 1960s, just in time for the introduction of the first plastic milk jugs in 1964. Low-calorie diet soft drinks were introduced in the 1950s. By 1966, there were at least eight diet sodas on the market. In the 1960s, diet soft drinks used artificial sweeteners known as cyclamates. In 1969, the government banned the use of cyclamates when studies found them to be a cancer-causing agent. Diet drinks adopted new formulas using saccharin. In the 1960s, soda bottles were made of glass. They came in a variety of sizes, from 6 ounces all the way up to 32 ounces. After they were empty, you could take returnable bottles to the store and get your deposit back. The first no deposit, no return glass bottles were introduced in the 1950s. Before 1958, beer cans were made of steel and were punched open with a church key can opener. Aluminum cans were introduced in 1958, and hybrid cans with steel bodies and aluminum tops were introduced in 1960. The hybrid cans were known as E-Z open and softop cans. The first pull-tabs were added in 1963. Steel cans were phased out during the 1960s in favor of aluminum and hybrid cans. The first successful soda cans went on the market in 1953. By 1960, the entire industry had adopted the format. Before 1963, soda cans were also made of steel and were punched open with a church key can opener. That year, soda manufacturers began to use aluminum cans and hybrid cans with steel bodies and aluminum tops. Pull-tabs were added in 1964. In 1964, John Holahan cut up some circus peanuts and sprinkled them on his Cheerios. This culinary experiment led to the creation of a cereal containing marshmallow bits....Lucky Charms. Feminine napkins with adhesive strips had yet to be invented. Pads were kept in place with lumpy, uncomfortable belts and pins. 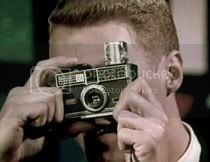 The Kodak Pocket Instamatic camera went on the market in 1963. This revolutionary camera used an easy-loading film cartridge instead of spool film, which made it more affordable and easier to use. At first, the Instamatic used flashbulbs, which were invented in the 1930s. The handy flashcube was introduced in 1965. 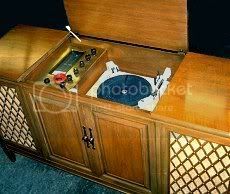 Young people didn't play their records on the hi-fi anymore.....they played their albums on the stereo. 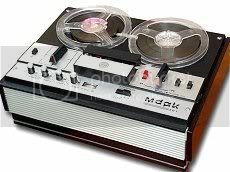 In the 1960s, most home recording was done on reel-to-reel tape recorders. Many albums were also sold on open-reel tape. Cassette tapes were invented in 1957 for use with office dictation machines. Manufacturers adapted and improved them for the home market, and in 1963 the result was the Philips Compact Cassette Recorder. In 1965, the first 8-track tape players were offered as an option in a handful of new car models. A home version went on the market the following year. Despite the convenience offered by cassettes and 8-tracks, their sound quality left a lot to be desired at this early date, and they wouldn't be widely used until the 1970s. At home, many radios were part of radio-phonograph consoles. Battery-operated transistor radios made it easy to take your music with you. Plugging in the earphone gave you one of the first personal audio systems. Home movie cameras were introduced in the 1920s. They became much easier to use in 1965 when the cartridge-loading Super 8 movie camera was invented. No birthday party or dance recital was safe anymore! Before solid-state technology was introduced, people filled paper bags with TV vacuum tubes and took a trip to the local drugstore to use the self-service tube-testing machine. Computer technology was developed during World War II and was adapted for the civilian market in the 1950s. By the 1960s, computers were already a necessity for university and government work. As they became smaller and more efficient, their use by smaller companies began to increase. Computers came in a variety of sizes. Super computers were room-sized and performed highly specialized tasks. Mainframes were also room-sized and provided centralized computing for the many remote terminals that were connected to them. Mini-computers, which were first introduced in 1960, could be as large as a piano or as small as a mini-fridge. They also provided centralized computing for remote terminals. During the 1960s, there were attempts to market the smallest mini-computers as desktop computers and home computers, but they were still much too expensive to truly be regarded as personal computers as we know them. The 1969 Honeywell Kitchen Computer was an extravagant flop. For computer hobbyists, there were also a handful of do-it-yourself computer kits available. These machines performed math calculations and played simple games. Some early computer terminals used video display screens, but most used teletype machines for input and output. Commands were typed on the keyboard, and the responses and prompts were printed out on paper. Data was entered at the keyboard, inserted on punch cards, or loaded from reels of magnetic tape. To speed things up, punch cards were prepared in advance using a keypunch machine. Although the new time-sharing technology gave operators more time at the terminal to enter programs from the keyboard, most programs were loaded from punch cards or tape. Output was printed on paper tape and standard teletype paper. Primitive graphics were introduced in the 1950s, when special computers used radar screens and light pens to track aircraft. In 1963, Ivan Sutherland invented Sketchpad, the first interactive graphics program. With Sketchpad, operators used a video screen and light pen to draw their own figures. This led to the development of computer-aided design (CAD), which was first used to design parts for the 1965 Cadillac. Modems were introduced in 1958. This technology made it possible for remote terminals to be linked to a central mainframe, which was known as time-sharing. In 1964, American Airlines was one of the first companies to use this technology when they linked 2,000 terminals in 60 cities to one mainframe over telephone lines. ARPA (Advanced Research Projects Agency) was formed in 1958. In 1962, the idea of an intergalactic network of computers was first proposed. It was easy to link terminals to a mainframe over phone lines, but linking entire computers was quite another matter! A new technology known as packet switching was developed to replace pure data transfer, which was inefficient and expensive. This was followed by new programs that allowed computers made by different manufacturers to interact with each other. Modems were improved and processors were built to connect the mainframes to the new network. The size of the network was measured by the number of processors, or nodes, that were connected to it. In the beginning, there were four nodes on the network: UCLA, Stanford Research Institute, the University of California in Santa Barbara, and the University of Utah. In 1969, after the first log-in crashed the system, the second log-in was successful and ARPANET made its first connection. The seeds of what would eventually become the Internet had been planted!